A day after former President Pranab Mukherjee's speech at RSS grand event a morphed picture of him is making rounds on the social media. 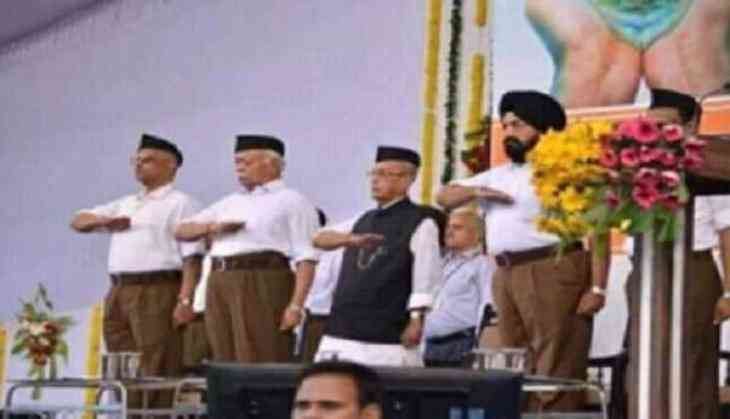 A picture shows Mukherjee, raising his hand in RSS leaders and cadres style of salutation was being viral on the internet. The picture annoyed Mukherjee's daughter Sharmistha Mukherjee and she calls it RSS and BJP dirty tricks. It is to be noted that Sharmistha had opposed Mukherjee's decision attending the RSS headquarters and took Twitter to repress her disagreement over it. “Hope @CitiznMukherjee now realises from today's’ incident, how BJP dirty tricks dept operates. Even RSS wouldn’t believe that you are going to endorse its views in your speech. But the speech will be forgotten, visuals will remain and those will be circulated with fake statements,” she had tweeted, before Pranab Mukherjee’s Nagpur visit. Earlier on Wednesday, Sharmistha Mukherjee had said her father was giving the BJP and the Sangha handle to plant false stories.